Game Studio Tycoon 2 puts you in the place of an independent game developer during the early days of the gaming industry. Play through 50 years of gaming history and develop on over 40 different platforms! 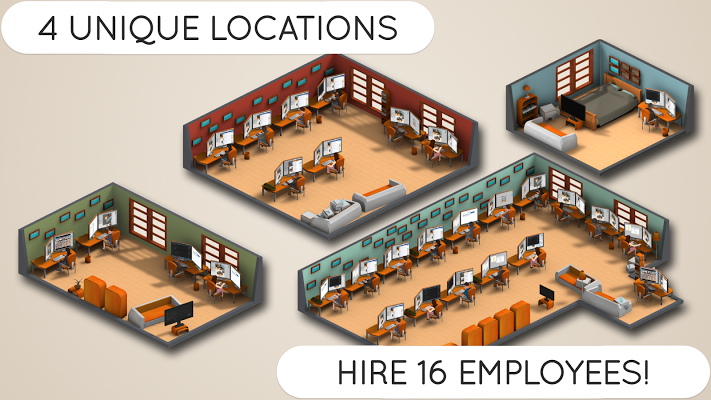 Expand your studio along the way and hire up to 16 employees! separate teams, raise money by getting investors and create games, consoles, and more! 4 unique locations with room for up to 16 employees! Amazing 3d graphics with motion captured animations! Create and manage Massive Multiplayer Online (MMO) games! You can determine the level of support to give the game and even create updates to boost sales! Manage up to 3 teams! Each team can work on their own project allowing you to release games and consoles quickly! A clean, minimalistic user interface allows you to play the game with ease.